Are Your Teeth Sensitive to Hot or Cold? Find Out Why! 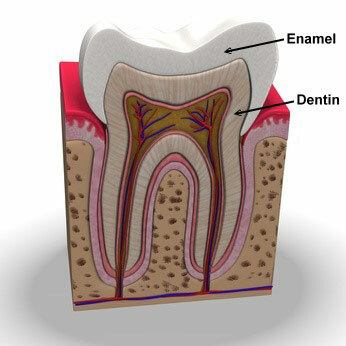 When the dentin loses the protection of hard enamel, the nerves under the tooth are less protected, triggering pain whenever it is hit with a hot or cold temperature. So, how do you fix this problem? When even brushing causes intense pain and even damage to #sensitive teeth, how are you supposed to keep protected against #sensitivity? Preventing loss of #enamel as you age is the key to preventing this problem. Here are some tips to protect your teeth against loss of enamel causing discomfort and pain. Good oral hygiene – The most obvious and important tip for keeping teeth and gums healthy. Gums protect your teeth just like enamel; your gumline prevents food particles and bacteria from entering below your gums. If your gums are unhealthy from lack of proper brushing and flossing, gums can recede, exposing tooth structure that is less protected causing discomfort. If brushing hurts, all the more reason to maintaining good oral habits. At Kristal and Forche Orthodontics we recommend a soft bristled toothbrush and non-abrasive toothpaste. Hard bristled toothbrushes encourage gum loss and whitening or anti-tartar toothpastes can be abrasive, causing the sensitivity. Visit a dentist! No one knows more about your teeth than your dentist. We specialize in movement of teeth and jaw growth and limit our practice to #orthodontic care, your dentist is the gate keeper for your overall dental health. If you’re experiencing #tooth sensitivity, just ask your dentist about it next time you’re due for a dental exam. You’ll be glad you did. Feel free to ask questions or leave comments about tooth sensitivity below. At Kristal and Forche Orthodontics, our goal is to educated our patients and families about all aspects of dental care.